What is the difficulty level for each map book? All the books basically work for 3rd through 12th grade. If you have students younger than 3rd grade or students with fine motor difficulties it would be best to start with the easiest level. Older students could easily start with any level. How long will one map book last? How many lessons are in one book? There’s not a set answer for this. Some parents have their students complete 4 or 5 pages a day until they are finished then repeat the process. We know of a teacher who draws a few pages once a week on a whiteboard stringing the “lessons” out for an entire semester. Some students who are really into it will complete the book in one sitting. I’ve actually done this myself when proofing the books. Time for that varies, of course. The books are meant to be repeated, so that eventually a student will be able to draw the map from memory without the need of the book. Students draw on a separate piece of paper, so the books will essentially last forever (well, forever, is probably not the right word!). Are all the map books the same scale? Unfortunately the continent books are not all to scale. I wanted to make them all to the same scale, but that would have made them far too complicated. 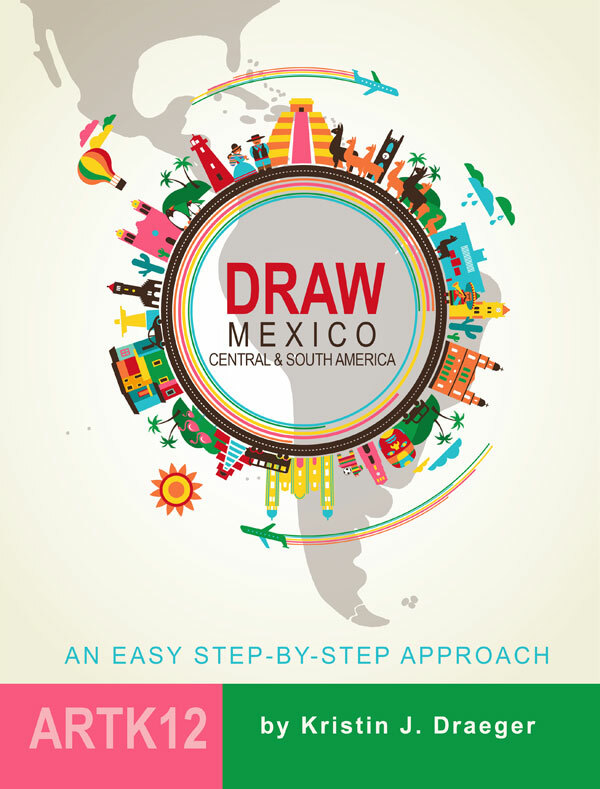 Draw the World is intended to give students an idea of scale and placement of the continents and the individual books of the continents are meant to make a more detailed drawing. That said, the only one that is extremely out of scale is Draw the USA. 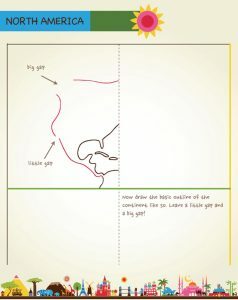 It is much bigger than all the rest, (it had to be to make all of the smaller states drawable on one sheet of paper). The others are very roughly compatible but certainly not exactly to scale. What would I recommend? Hmmmm. If you were to draw all of the continents separately (maybe draw the USA on a half sheet of paper to make it smaller) then mark the equator on all of the continents (that are applicable), you could lay them out in roughly the correct places. Older students could perhaps start with Draw Europe in the center of a very large piece of paper/poster board, then add Africa below and then add Asia I and Asia II and Oceania. Then they could add Canada, Mexico and South America on the “west” side of the paper, then use the directions from Draw the World to add Antarctica at the bottom. I’m sorry I don’t have any easier ideas, but I hope this helps. 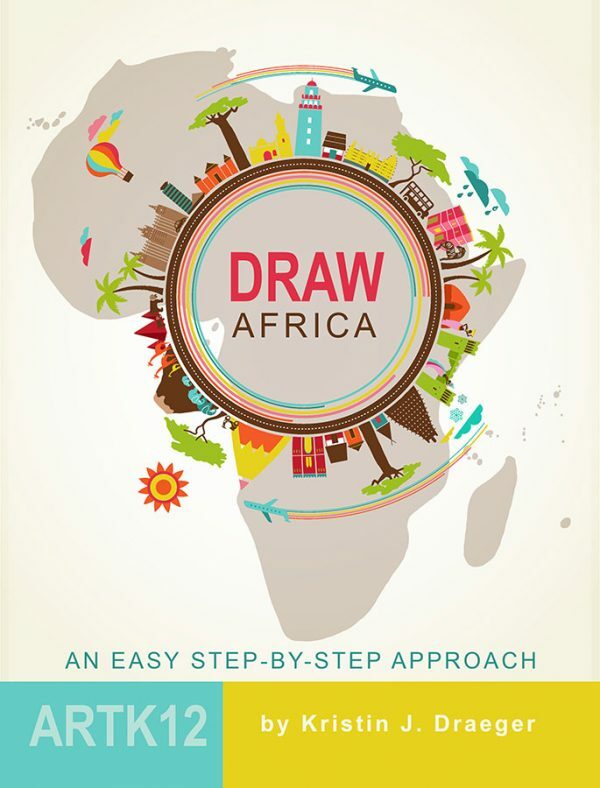 Draw Africa has a Kindle edition. What about the other map books? Draw Africa was an experiment. We wanted to see how the books would sell in a Kindle format. Unfortunately, we sell very few Kindle editions and it is very time-consuming to put together these editions. At the rate they are selling now, it is just not worth the time do so. Amazon’s tools do get better and better for migrating print editions to the Kindle format so maybe in the future we’ll be able to do that without the heavy time involved. But I don’t expect that to happen anytime soon. Are the geography books appropriate for high school? The 3rd-8th grade age recommendation is just a suggestion. In reality it is completely appropriate for high schoolers as well. They may find the text a little corny (my attempts at keeping the younger students’ attention through humor), but the content of what they will learn will definitely challenge them unless they can already draw all of the countries of the world by heart. That said, after they master drawing all the books I would have them go back and add the country/state capitals and major rivers, deserts and mountain ranges for each book. I do not include this information in this series simply because the maps would become too confusing/complex for younger students to manage, but high schoolers could easily research and add this info. The price for the map books on Amazon seems kind of steep. Any reason for that? All our books are printed on demand by Kindle Direct Publishing, an Amazon Company. On demand printing is more expensive, particularly full color, than traditional printing. There are several managerial advantages for us doing it this way (we run ARTK12 from home, just the 3 of us), but it does make the books more expensive than they would be printed traditionally. We do offer discounts on books purchased through our website if you buy sets or multiple copies which can bring the price down quite a bit on a per book basis. Also, there are times when Amazon drops the price considerably. I haven’t been able to figure out why or when they do this. Is it to drive sales or is it because sales volume is high already? I don’t know. But I remember for a couple of days the USA book was $12.53. One of the great mysteries of life! My guess would be that was only for Prime Members. But if you really want a good deal on one book, check Amazon periodically. I only saw the price that low once in April of 2017, so I don’t know if it will ever happen again or if it has happened since. Quite often I see the books listed under $18.00 on Amazon. Can I make photocopies of the map books? Our copyright does not allow photocopies for any type of classroom use. 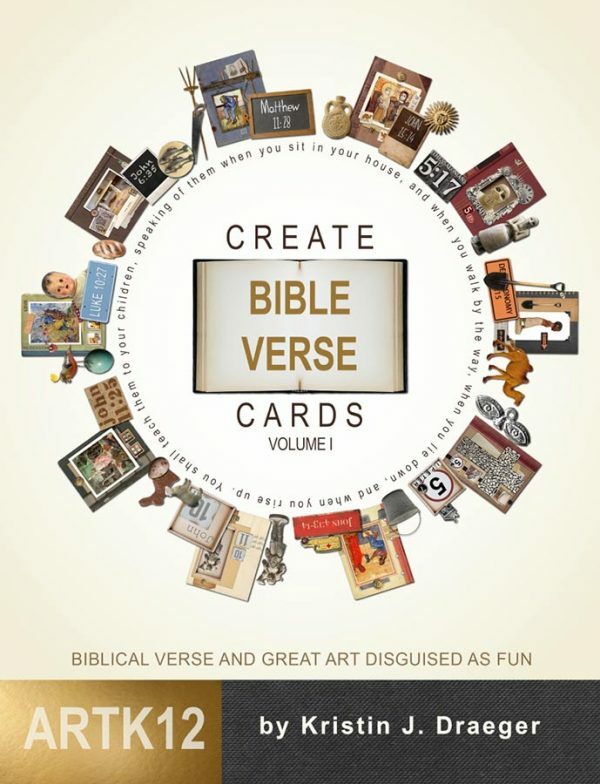 If you are a school, homeschool coop or a teacher using our books for private classes you might think about bulk ordering our books (we may wave the minimum order amount depending on your situation). Some teachers use one book and a whiteboard and have their classes follow along. If you are a homeschooler teaching your own children in your home, you may make photocopies as needed. It is against our copyright policy to distribute or use any of these copies outside your home. Whew! Did that sound ominous enough? Why aren't there more details in the map books? Kristin sees this criticism a fair amount. The short answer is: because there is not supposed to be. There are plenty of books out there that will give you capitals and rivers and cities and whatever else you want. These geography books grew out of Kristin not being able to find something like this for our son. 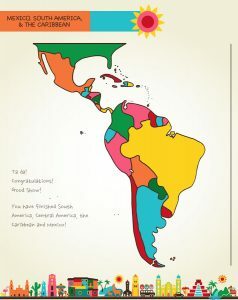 The focus is intentionally narrow: With easy step-by-step instructions the books introduce children to geography by giving them a primer in the borders and locations of states, provinces and countries. That’s it. 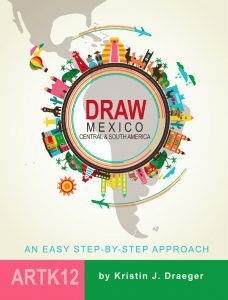 With some practice your students will be able to draw the subject matter from memory. 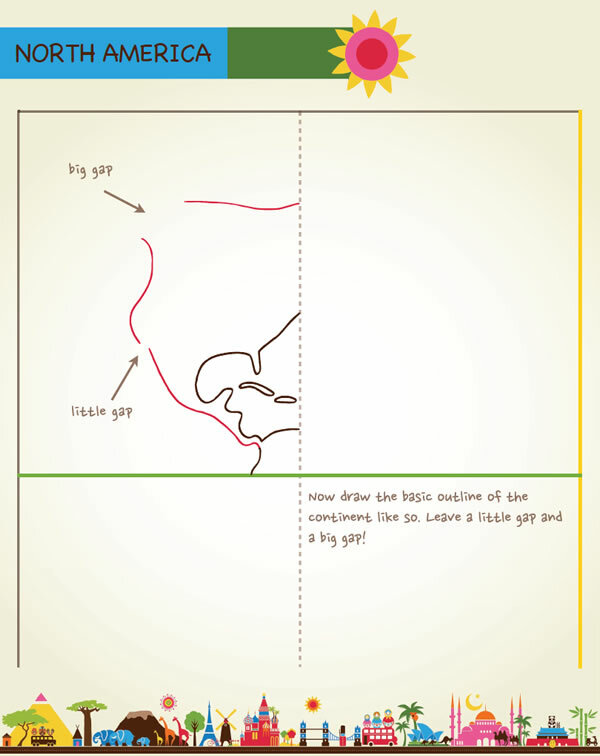 For more on this see the post: In Defense of Cartoon Geography. 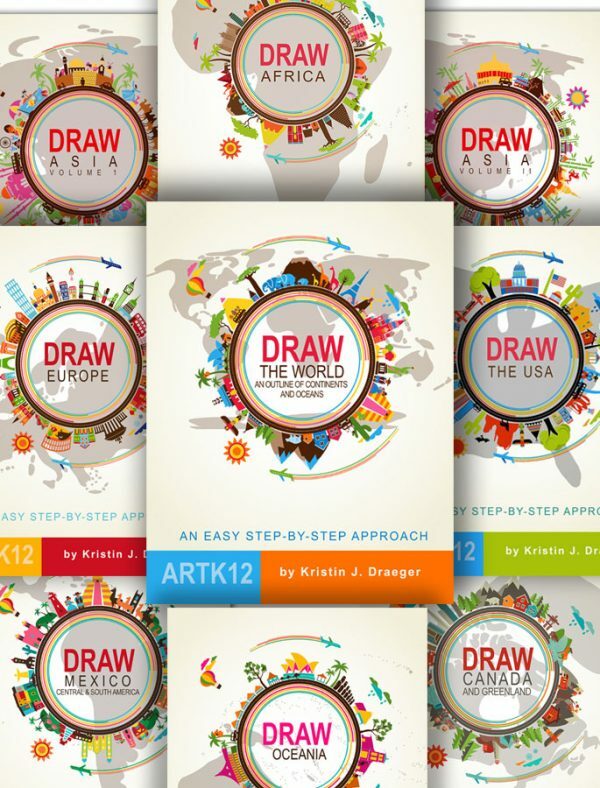 Why is Draw Asia in two volumes? Asia is big. Really, really big. It worked better for both the books and for drawing the countries to split Asia into two volumes. Volume II does include a template for Volume I, but it would be best to start with Asia Volume I and then move on to II. Wouldn't it be better if the geography books were spiral bound? Yes! Yes! And Yes! Unfortunately, our printer (Kindle Direct Publishing, an Amazon.com company) does not offer that. Many people take the books apart and spiral bound them or put the pages in slip covers, three hole punch them and add them to notebooks. Just what you need as a homeschooler, right? More work! Sorry! See what Ashley did at Under the Sycamore Tree (lots of photos).